While it is Israel’s third largest city, Haifa tends to be excluded from conversations about viable landing spots for English-speaking immigrants. That’s often because Jerusalem, as the Jewish people’s eternal capital, draws with its religious, traditional vibe, while Tel Aviv is the center of modern Israeli business, culture and hipdom. Haifa? It’s up the coast there somewhere. In truth, Haifa is a gem that English-speaking Olim are discovering, thank you very much. It’s a major center in its own right, with industry, technology, tourism and the highest of higher education (see: Technion, The). Municipal officials in Haifa, Israel’s third largest city, consider potential English-speaking Olim well-worth pursuing – so much so that a full-time expert is employed as the immigrants’ point of contact. In September, Haifa will begin offering Ulpan (Hebrew-language) classes for middle school and high school students, which will be held at a high school located between the Ahuza and Neve Shaanan neighborhoods, where many English speakers live. According to Haifa’s 2016 statistical survey, 18 percent of the city’s nearly 300,000 residents speak English as their first language, she said. Rivka Greenberg, now 54, moved in 2011 from Cleveland to Ahuza and is thrilled. She and her husband Maury wanted enough Anglos around to give them a sense of home and people with whom to discuss issues related to their absorption into Israel. They knew that their daughter and son, then entering ninth and seventh grades, respectively, would experience what she called “short-term pain” getting acclimated, but added that “the short-term gain has been tremendous,” too. From their apartment in Ahuza, on a hilly street high atop Haifa, Rivka loves the views toward the Mediterranean Sea and the lovely breeze wafting in. 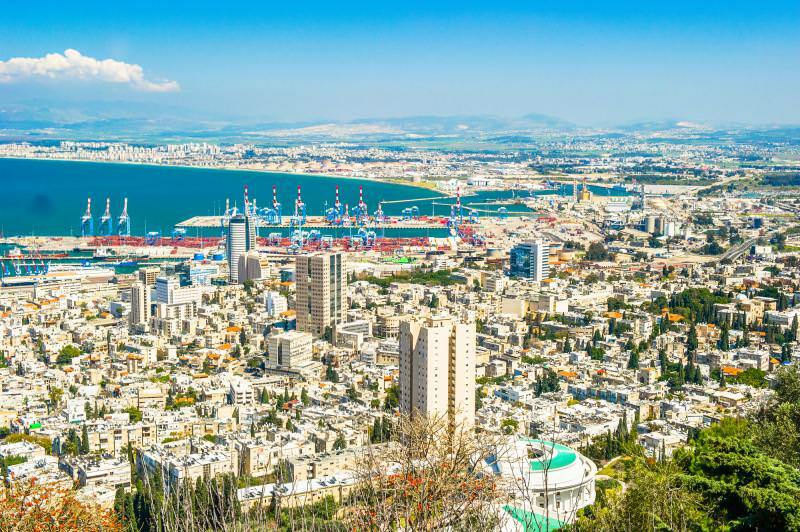 With its beach and topography, Haifa has “the best of both worlds” of Tel Aviv and Jerusalem, but is “not as expensive and crowded,” she said. “It’s a big city without all the stress and expense of big-city life,” Rivka said. Ahuza’s assets that Greenberg pointed to include its diverse Jewish population (Reform, ultra-Orthodox, Conservative and Orthodox), jobs (she works at the nearby Technion and Maury at Haifa University, and there’s a strong hi-tech presence in Haifa) and health care accessibility (five hospitals). Ahuza residents are hospitable toward Olim, Rivka said. She would know. The family received weekly invitations for Shabbat dinners when they first arrived; someone even came by each week to provide a ride to and from a supermarket. “The community here is tremendous,” she said. That’s what Zahava Stolovitsky found in Ahuza, too. She and her husband, Mark, are modern Orthodox, and were delighted to learn that their synagogue hosts a women-only Torah reading on the Simchat Torah holiday. “I was very impressed, and said, ‘Ah, here’s a community willing to try new things,’ ” she said. Like Rivka, Zahava likes the city’s diverse demography – in her case, pointing out that Christian, Muslim, Druse and secular and observant Jews make Haifa home. Another family that sought a homey area that wasn’t Anglo-dominant was the Susnows, who settled in Neve Shaanan. Matt and Stef, from Los Angeles and Buffalo, New York, respectively, sought a national-religious observant area with warm neighbors, and Neve Shaanan has met their needs. While they tend to be a bit to the left religiously and politically than their neighbors, “We fit in fine. It’s not something we struggle with,” she said. Their neighborhood is filled with young families and with parks, and is “very child-friendly,” said Stef, the mother of 3-year-old twins and a 1½-year-old. Many cafés are nearby, so Stef, who works in educational tourism for the Jewish Agency, sometimes takes her laptop and phone there to work instead of at home. A downside, she said, is that buying an apartment in Neve Shaanan can be expensive. Zehava noted the same in Ahuza, where she and Mark, immigrants from Dallas, work as English teachers.